For better or worse, there will always be a need for health innovation and change, as health issues always lie in wait for an aging population and new issues are constantly arising. This year was no different. Health is global, national, provincial and personal. The world is in a faceoff against Ebola; the Ontario government spent $50 billion on healthcare infrastructure that struggles to serve our aging population; and my dad was diagnosed with prostate cancer. Unfortunately we can’t satisfy these medical challenges with milk and cookies like good old St. Nick. So what have we been up to instead? I am happy to report that my dad is in 100% remission following a relatively new form of treatment that uses temporary radioactive seed implants to fry local cancer cells. At MaRS, MaRS Health has the privilege of working with startups that are combatting worldwide health issues, such as prostate cancer and Ebola, as well as with those working to improve healthcare system efficiencies, access to healthcare providers and consumer-empowered health. Many of these companies are working their way into that $50-billion budget line, and MaRS is here to help. 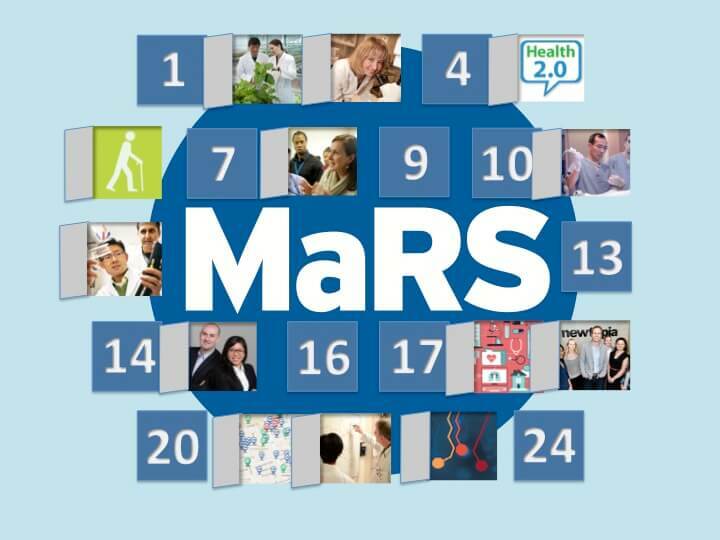 Here’s a look at 25 highlights from Ontario’s health entrepreneurs in 2014, as well as some of the things MaRS Health is doing to help young ventures get to market with their life-changing technologies. In a way, our own little MaRS Health advent calendar! SimBioSys and its machine-learning algorithms were acquired by John Wiley and Sons to support chemists who are synthesizing target compounds. LiberateIdeas’ doctor-patient communication app, LiberateHealth, was acquired by NexJ Systems. PlantForm has been busy this year! The company entered a joint-venture production and distribution agreement of biotherapeutics with Brazil’s PharmaPraxis, using PlantForm’s tobacco platform technology. The company was also enlisted by the Canadian and American governments to develop therapeutics against alternate strains of Ebola to prevent further outbreak, and was asked by Canadian and American militaries to develop an anti-nerve gas agent. Oxalys Pharmaceuticals was granted orphan drug status by the United States Food and Drug Administration (FDA) for therapeutic use against Huntington’s disease. Intellijoint Surgical opened a manufacturing facility in Waterloo, Ontario. It also earned FDA clearance and landed its first American customer, Massena Memorial Hospital in New York State. Highland Therapeutics closed US$25 million in financing to complete the clinical development of its lead therapeutic to alleviate symptoms of attention deficit hyperactivity disorder. Newtopia expanded into the US market with its personalized health programming and earned equity investments from Argo Group and Bloom Burton. Synaptive Medical struck up a partnership with NICO Corporation to improve the standard of care in brain surgery. AvidBiologics signed research and licensing agreements with National Research Council Canada to continue developing therapeutics targeting breast, lung and head-and-neck cancers. SeamlessMD completed a one-year pilot of its remote monitoring app with Toronto East General Hospital that got 100% patient satisfaction, and showed significant reductions in surgery cancellations and unnecessary phone calls. Knixwear pitched on the CBC Television series “Dragons’ Den,” earning three offers, and settled on one to help its moisture-nixing undergarments reach women internationally. Mira IV Acquisition Corp. entered into a letter of intent with Profound Medical, taking a step toward going public in order to help advance its use of MRI guidance and ultrasound energy to deliver thermal ablative prostate therapy. BlueDot secured Series A financing with Horizons Ventures to advance its big data business that tracks and analyzes the risks of global infectious diseases. Open Source Health and Geneyouin collaborated to design a next-generation genetics-integrated electronic health record to improve wellness and practice prevention. Eve Medical expanded its social impact footprint by joining the SVX, winning the MaRS Impact8 program supported by Saint Elizabeth, and sitting on a panel with Sir Richard Branson during the launch of the MaRS Impact Fund (supported by Virgin Unite and Mindset Social Innovation Foundation). Three very different health companies took to crowdfunding on Indiegogo: VitalSines and iHeart, the company’s vascular sensor that determines physiological age; Code4Armour and its electronic medical emergency wristband; and Virocarb, an HIV therapeutic. Colibri Technologies executed a distribution agreement with Japan Lifeline for its cardiovascular imaging-guided system. Kobo co-founder Michael Serbinis announced the launch of his next startup, League, a digital health and wellness platform, with $4 million in seed funding. Market Intelligence published four thought leadership and market insights pieces on accessibility, wearable health tech, and decentralization and connected care (Parts 1 and 2). MaRS helped facilitate and host several health-related meetups, including Health 2.0 Toronto, the Health Technology Forum and Hacking Health Toronto. MaRS implemented the Health Development Series to increase peer-to-peer interactions and discussions about health-specific product strategy and business development topics currently outside the scope of MaRS’ entrepreneurship programs. Zayna Khayat stepped in as interim lead of MaRS Health venture services to build relationships with health systems and open up markets for startups. Salim Teja took on the role of executive vice-president of venture services to solidify global corporate and investment partnerships to support MaRS ventures and scale our services. Les Levin, chief scientific officer of MaRS EXCITE and an internationally recognized guru in health technology appraisal, is working, along with Zayna, to take the EXCITE pre-market technology evaluation program from its current Ontario base to a national and international platform. MaRS began collaborating with the Buffalo Niagara Medical Campus and Jacobs Institute to provide Ontario ventures with a beachhead into the United States. MaRS Health continues to evolve to better help life science startups, open up markets and drive the health economy. We look forward to continuing the journey in 2015 and seeing what these health ventures accomplish next year. Happy holidays and a happy new year! If you’re interested in becoming a Health client at MaRS, check out what MaRS Venture Services offers and see if your company is eligible to apply.